The region that Loendorf and his colleagues have been exploring was once home to the Jornada Mogollon, a culture of foraging farmers similar to the early Ancestral Puebloans, who occupied the territory from about the 5th to the 15th centuries. Among the marks the Jornadans left on the land were sophisticated and colorful pictographs, ranging from recognizable plant, animal, and human forms to more abstract patterns. They also crafted painted pottery in signature styles of red, brown, and black, known today as El Paso phase ceramics, which vary by era and design. Over the past three years, Loendorf and his colleagues have been studying rock art throughout the Jornadans’ range — first at Fort Bliss, then on Bureau of Land Management holdings around Carlsbad, and finally on property owned by New Mexico State University near the town of Dona Ana. 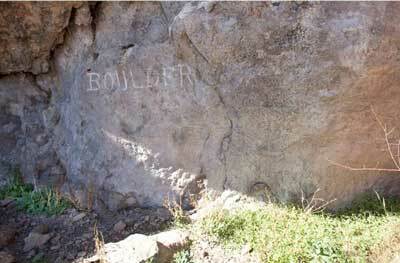 The triangle motifs first showed up at about 20 sites that the team surveyed at Fort Bliss, Loendorf said. But it was during their second survey — of the lands around Carlsbad — that they noticed tobacco and datura growing under similar pictographs found there. And when their work took them farther west, to record pictographs near Dona Ana in the Rio Grande valley, the team discovered the same pattern yet again, both in the rock art itself and in the plant life around it. “What really started to drive it home was the fact that the paintings at the [Dona Ana] sites were the same thing — they were painted triangle signs, in red and black and other colors,” Loendorf said. All of the sites that featured the triangle motifs also turned up sherds of Jornadan pottery, he noted, found in deposits that have been radiocarbon dated to around 1000 CE. To help piece these clues together, Loendorf turned to the archaeological literature of southern New Mexico, and found that similar triangular patterns of rock art had previously been recorded throughout the Jornada region. “I’ve now found a half-dozen more sites that have these painted triangles, and there’s tobacco growing right at the base of the panels, or somewhere near them. The key to the meaning of the triangles, as well as the hallucinogens, may be in the ethnographic record of modern native groups, particularly in northern and western Mexico, Loendorf said. Groups ranging from the Rarámuri, also known as the Tarahumara, and the Huichol have both been known to induce visions using the same wild tobacco found at the rock-art sites, he said. While all of the 24 sites with the triangle motif were found to have tobacco growing nearby, only three featured outcrops of the more deadly datura — a plant also known to have been used, and feared, in some Southwestern cultures, Loendorf added. “No one’s really drawn the correlation between datura and rock art sites,” he said. 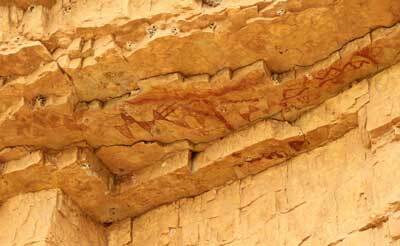 “We see it at a lot of rock art sites, but it grows in a lot of other places as well. It’s the similarities to the Huichol, however, that Loendorf suspects may best explain the significance of the triangular shapes themselves. That’s because series of triangles, especially one triangle inverted over another to make an hourglass shape, is typically recognized as a symbol of water, and the vessels used to carry it. Loendorf says that more study is needed, but the evidence gathered so far suggests that the mysterious zigzags appearing throughout southern New Mexico rock art may be thousand-year-old entreaties for life-giving rain. “I think that probably the ultimate reason for going through this trance is to intervene with the spirits to make it rain,” he said. In which case, the tobacco and datura were likely not planted intentionally, but rather were seeded accidentally as shamans brought the plants in for ceremonial use, leaving living reminders of the materials they used to talk with the spirits. “From my perspective, every time I record a rock art site, I think that I’ve just done something important, for the very fact that we’re losing them so fast. And once you get some recorded, then you can see these patterns,” he said. yes i agree with Cory, knowing if the various plants share a common lineage or divergence would give evidence of the cultural connection and not just one of coincidence or convergence. It would aid in clarifying the notion that the plants were brought to the site rather than the site being selected due to the plants being in the area. Old news. Anyone who has been to a rock art conference in the last 20 plus years, anywhere in the world, such as Mr. Loendorf himself, would know that hallucinogenics have been linked to rock art in many ways. Ditto on the old news. It may be that the origin of an ancient mushroom religion, as proposed by R. Gordon Wasson, is rooted in the shamanism of the Siberian forest people and came to the New World as early as the Paleolithic. According to Wasson, the term shaman is not native to Mesoamerica or even to the New World but derives from the languages of Siberia. Siberian shamanism incorporates ecstatic trances brought on by a ritual of dance and the inducement of hallucinations, most commonly through the consumption of some hallucinogenic substance. The intention was to open communication directly with the spirit world, often through a form of animal transformation. The worship of animal spirit companions and the concept of human-animal transformation is so ancient, that the origins of these beliefs appear to predate the development of agriculture. Since these beliefs are also present throughout North and South America that they may very well have been brought there by the first hunters and gatherers to reach the New World. We find the first evidences of these shamanistic rituals in Mesoamerica in the art of the ancient Olmecs along with the development of agriculture, food production, and settled village life. The foundation of shamanism, was the sacred substances used in rituals to attain divine ecstasy, which became the foundation of nearly all the religions of Mesoamerica and South America. To me this article is not about old or new information about hallucinogens and their relationship in shamanistic rituals. There is plenty of consensual evidence on such offerings. This article is about their association with the triangle motif as a water gourd and calling forth the sacred rains so scarce and unpredictable in the arid southwest; and other repetitive images in rock art associated with the rain. . Interesting article professor Loendorf. .